True Messiah is a deterministic war game with tactics, board control, and deck-building. At the end of each round, bid in secret on new miracles for your cult. Most miracles have only a single copy, which means that you’ll be constructing a deck with vastly different powers from everyone else at the table. The first player to defeat an enemy player wins! How can I get True Messiah? Order here on the Sinister Design shop! Can you summarize the rules? 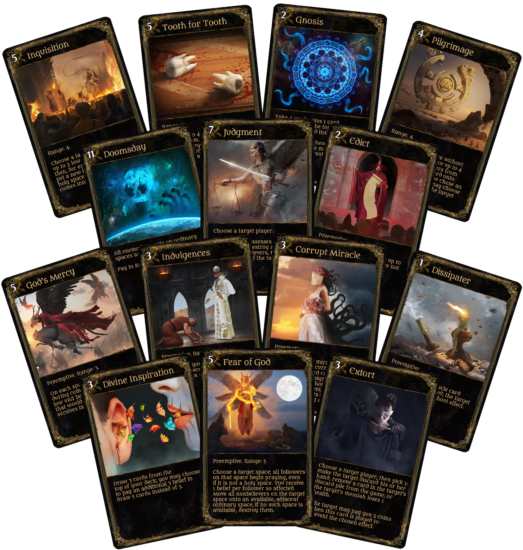 Each player begins True Messiah with 9 miracle cards; 7 followers; 5 coins; 1 holy city; and their chosen messiah. At the start of the game, each player sets up their starting position on the board, then the first round begins. Beginning — flip over all praying followers; recruit new followers (2 if your messiah is alone on a holy space, +1 follower for every holy space you have with 2 or more followers on it); build temples (on each ordinary space where you have 4 followers); and draw back up to 6 cards in your hand. Action — move your messiah, plus up to 6 low units (followers or nonbelievers); have followers on holy spaces to pray to produce belief points; spend belief points to play miracles from your hand. Combat — all adjacent enemy units on the board can attack each other. Each low unit that isn’t praying has 1 attack; each attack kills 1 low unit. Messiahs have 4 attacks, avatars have 3. Casualties occur simultaneously. End — any empty buildings with enemy units adjacent are captured/destroyed, then looted. Then, if you still have more than 3 miracle cards in your hand, discard down to 3. Your turn ends. Once every player’s turn is completed, the market opens. 5-7 miracle cards are revealed from the top of the marketplace, and each player secretly selects a number of coins to bid and places their bid into a closed fist. When all fists are over the table, the players reveal their bids simultaneously. Going from the highest bidder to the lowest, each player spends their bid on up to 2 cards–you can pick to maximize the use of your coins, or choose to overspend on cheaper cards to shut out lower-bidding players. No matter which cards you get, you always lose your whole bid. Purchased miracles go into the purchaser’s discard pile, to eventually be reshuffled into a new deck. The market closes; each player gains 1 coin per holy space and 1 coin per prosperity monolith, and a new round starts. The first player to defeat an enemy player (by slaying their messiah, capturing their holy city, bringing them to less than 4 followers, or causing them to possess less than 8 miracle cards total) wins the game. Click here for the True Messiah rulebook [PDF]! Yes! Click here for the True Messiah BoardGameGeek page. How do I get True Messiah, again? Get it right here on the Sinister Design shop!